en Does Ramadan fasting have any effects on menstrual cycles? Background: During the month of Ramadan, millions of Muslims abstain from food and drink daily from dawn to sunset and people actually experience repeated cycles of fasting and refeeding. Menstruation is a normal physiological process that its regularity is controlled by hypothalamic-pituitary-ovarian axis. Etiology of menstrual dysfunction includes weight loss, hypoleptinemia, abnormal eating behaviors, exercise, and psychological stressors. Objective: To investigate the effects of Ramadan fasting on menstrual cycles. 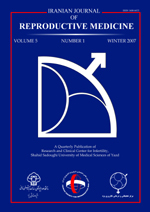 Materials and Methods: This analytic cross-sectional study was performed on 80 female college students resident in a dormitory of Hamedan University of Medical Sciences. A questionnaire including demographic characteristics and menstrual calendar was filled by all participants. All analyses were performed using the statistical software SPSS for Windows version 11.5. Results: We found 11.3%, 30%, and 16.3% of participates had abnormal menstrual pattern three months before, during and three months after Ramadan, respectively. In participates who fast more than 15 days, menstrual period had significantly more abnormality than participants who fast less than 15 days. Considering our results we demonstrated that menstrual abnormalities during Ramadan month reach to their peak and three months after Ramadan reduce but do not return to previous condition. Conclusion: This study confirms that menstrual abnormalities including oligomenorrhea, polymenorrhea and hypermenorrhea increased during Ramadan especially in participates with more than 15 days of fasting.